Medicare Savings Programs (MSP) offer assistance with meeting the costs of Medicare premiums and deductibles. The MSPs include the Qualified Medicare Beneficiary program (QMB), Specified Low-Income Medicare Beneficiary program (SLMB), and Qualified Individual program (QI). All of these help Medicare beneficiaries of modest means pay all or some of Medicare’s cost sharing amounts (ie. premiums, deductibles and copayments). To qualify an individual must be eligible for Medicare and must meet certain income guidelines which change annually. Please note that the eligibility criteria listed below are federal standards; states may have more, but not less, generous standards. Payment of Medicare Part A monthly premiums (when applicable). Payment of Medicare Part B monthly premiums and annual deductible. Payment of co-insurance and deductible amounts for services covered under both Medicare Parts A and B. Must be eligible for Medicare Part A (even if not currently enrolled). Must undergo redetermination for the benefit every year. Payment of the Medicare Part B monthly premium only. * $20 = monthly SSI general income exclusion. Individual states may be more generous with the income and resource amounts above. Requests for applications for QMB, SLMB, or QI benefits are made to the state Medicaid agency. Eligibility for QMB is effective on the first day of the month following the month in which the Medicaid agency has all the information and verification necessary to determine eligibility. SLMB and QI entitlement may be retroactive. For more information, please telephone your local Medicaid office. You can find your local Medicaid office at https://www.medicaid.gov/about-us/contact-us/index.html. 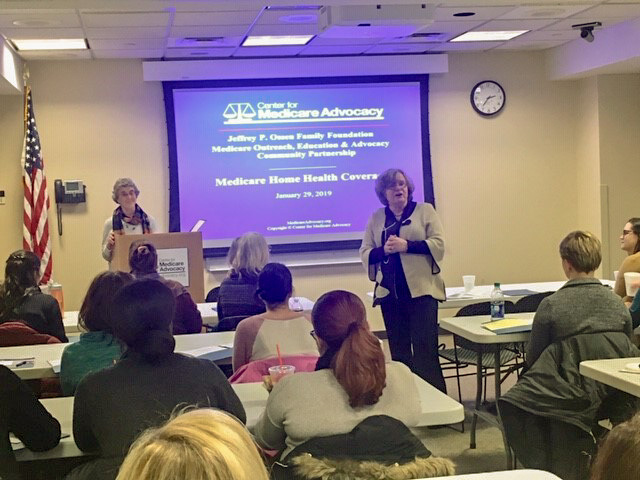 As part of the Center for Medicare Advocacy’s Medicare Outreach, Education and Advocacy Project with the Jeffrey P. Ossen Family Foundation, we hosted a seminar on January 29th for Eastern Connecticut health care coordinators, case managers, human service professionals, and family care givers. The seminar focused on Medicare-covered home health care, law, and realities. Together we hope to build a community effort to help advance Medicare home health access for individuals, and to improve access system-wide. The Center has developed an array of resources, also available in Spanish, to help beneficiaries, and those who help beneficiaries, understand and access Medicare home health coverage.